Conceiving and developing a new product is a huge challenge for companies, but even if you hit it out of the park and develop something great, sometimes the challenge is just beginning. Ensuring that a new product becomes the bonafide revenue driving machine it was intended to be isn’t a forgone conclusion, it takes focusing around that goal. Digital engagement firm HelloWorld experienced a common new product struggle. They invested significant time and resources in developing a great new product that was expected to succeed, but instead of becoming their next great customer offering, the product struggled out of the gate and leadership was left looking for solutions to improve performance. 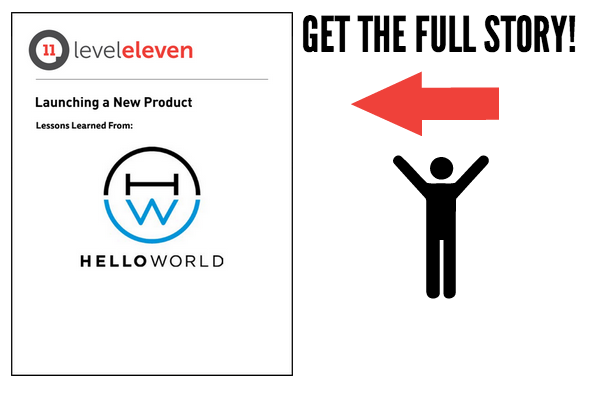 Take a look at how HelloWorld motivated their team to rally around a new product after its initial disappointment to drive impressive results!